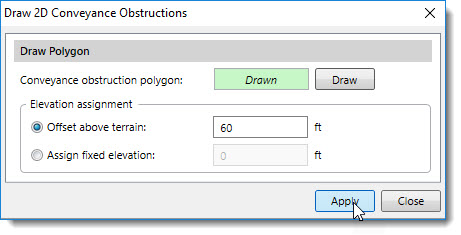 How To Assign and Draw 2D Conveyance Obstructions in HEC-RAS? Conveyance obstructions can be assigned to the 2D mesh to account for regions that are permanently blocked from conveying flow. 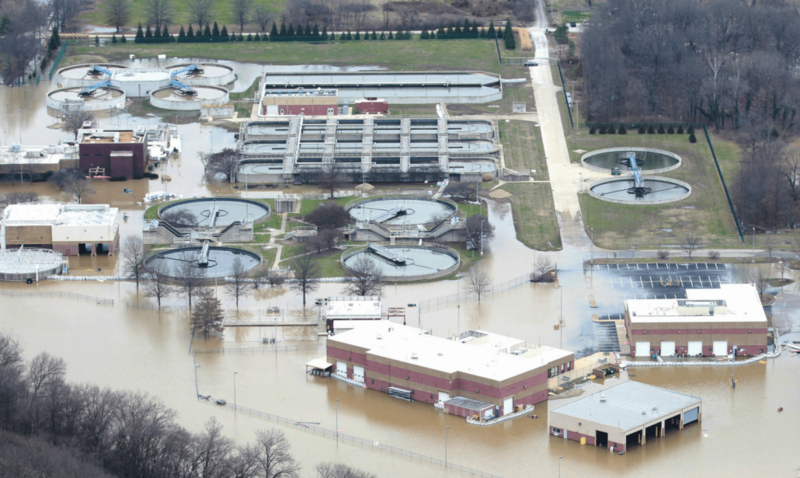 Conveyance obstructions, such as buildings and other structures, decrease the flow area and add additional wetted perimeter where the water comes in contact with the obstruction. 2D conveyance obstructions are assigned using polygons. The software will automatically refine the 2D mesh to accommodate the conveyance obstruction shape. 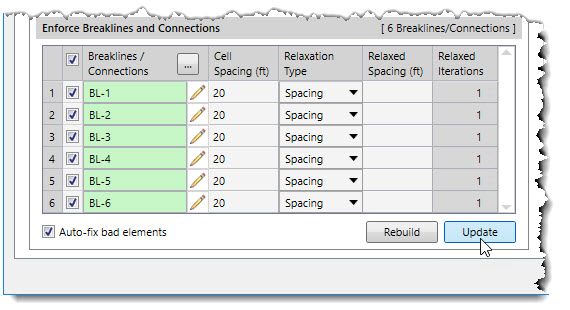 From the Input ribbon menu, click the 2D Flow Areas menu item, and then select the Assign 2D Conveyance Obstructions command. 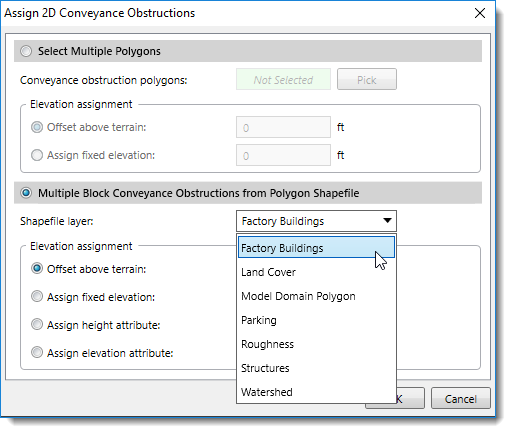 The Assign 2D Conveyance Obstructions dialog box will be displayed. The following sections describe how to use these assignment options. Choose the Select Multiple Polygons radio button option. Then, click the [Pick] button. The Assign 2D Conveyance Obstructions dialog box will temporarily disappear and a prompt will be displayed on the status line with next steps. 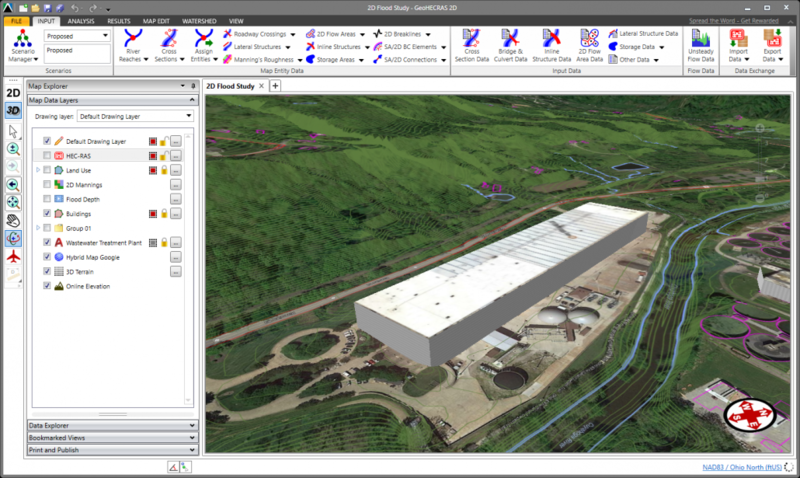 Select the polygons on the Map View. Then, right-click and choose Done from the displayed context menu. The Assign 2D Conveyance Obstructions dialog box will redisplay. 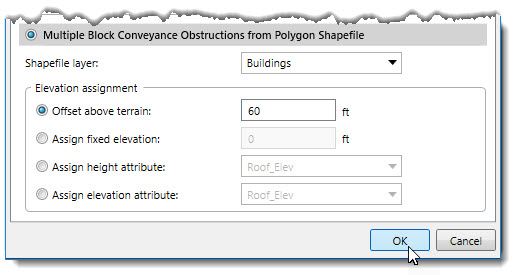 In the Elevation assignment section, select the desired option for assigning the conveyance obstruction elevation. Then, enter the elevation value. Click the [OK] button. 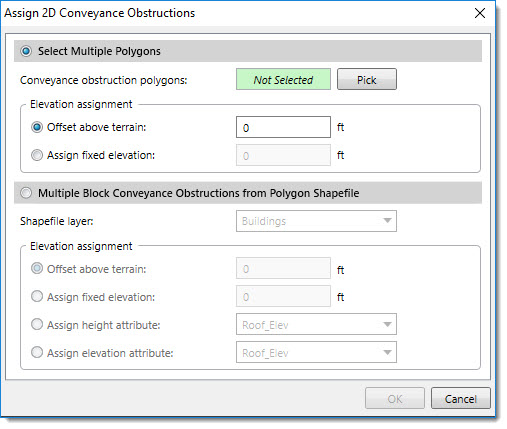 The selected polygons will be assigned as 2D conveyance obstructions. 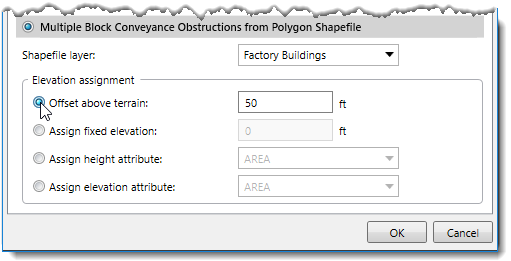 Choose the Multiple Block Conveyance Obstructions from Polygon Shapefile radio button option. The software will display all loaded polygon shapefile layers in the Shapefile layer dropdown combo box. Select the corresponding shapefile layer. 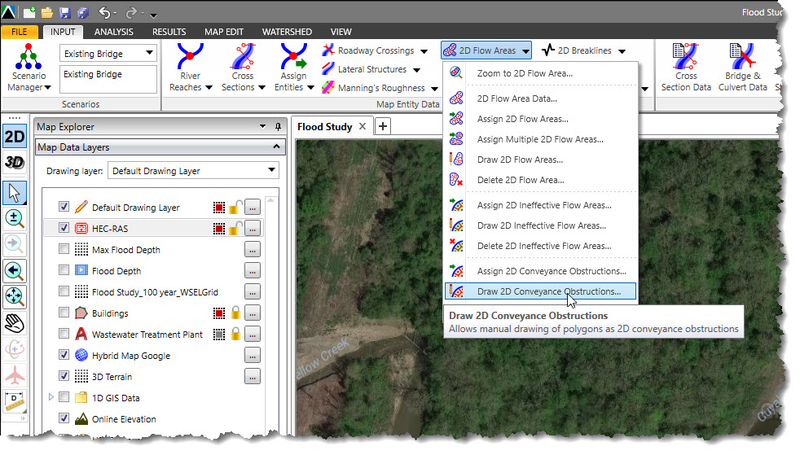 From the Input ribbon menu, click the 2D Flow Areas menu item, and then select the Draw 2D Conveyance Obstructions command. The Draw 2D Conveyance Obstructions dialog box will be displayed. Click the [Draw] button. The Draw 2D Conveyance Obstructions dialog box will temporarily disappear and a prompt will be displayed on the status line with next steps. Draw the polygon on the Map View. 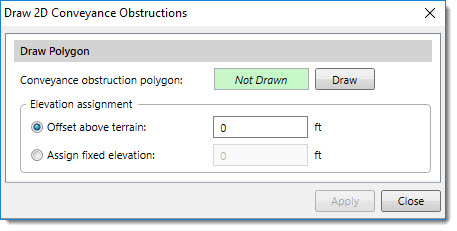 After the polygon has been drawn, the Draw 2D Conveyance Obstructions dialog box will redisplay. Repeat the process for all other buildings to be assigned as 2D conveyance obstructions. 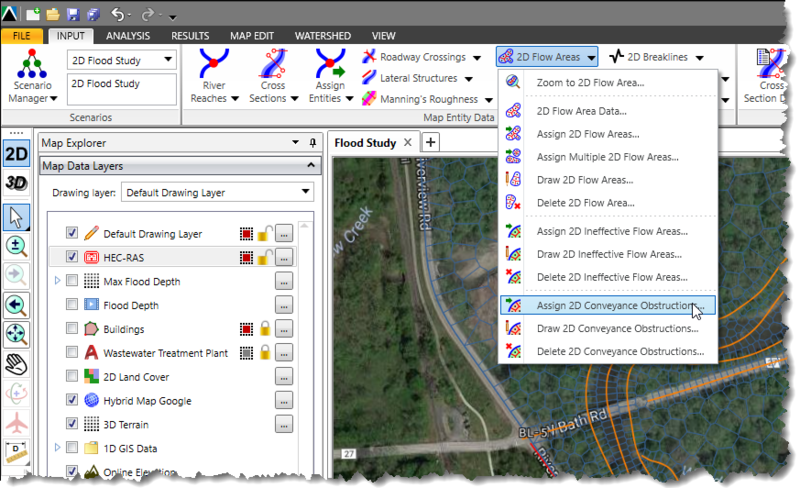 Double-click on the 2D mesh on the Map View to display the 2D Flow Area Data dialog box. Click the [Update] button and the software will incorporate the 2D conveyance obstruction into the 2D mesh.